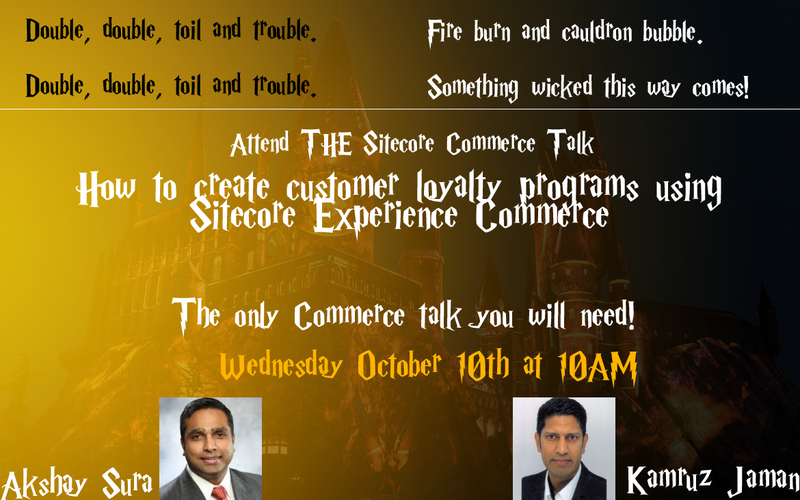 Kamruz and I are presenting at the Sitecore Symposium on Wednesday October 10th at 10AM. Our presentation topic is: How to create customer loyalty programs using Sitecore Experience Commerce and Email Experience Manager. As the title suggests we will be tackling Sitecore Commerce and a couple of user journeys on using the loyalty system we have built. We have a ton of material to cover and hopefully we will get to go over everything. Lots of demos and code to go through and light on slides. Demo time! – #1 -> Showcase a new user journey on purchasing product, receiving points, ExM and Marketing Automation Magic! Demo time! – #2 -> Showcase an existing user journey purchasing product, receiving points, paying with points, cross promotion and Marketing Automation. Demo time! – #3 -> Showcase an existing dormant user journey – using Marketing Automation to increase existing customer sales and point promotions. Analytics overview and what we have collected so far. We hope to get this done in 45 mins, so get ready and attend the only commerce talk you will need at the Symposium.